Thermography is not a new science, but instead is the mode with which damage to tendons, ligaments, muscles and even nerves can be shown as colorful scan readings. For example, if a properly exercised horse repeatedly shows lameness at a certain point in its exercise or performance routine a veterinary exam is usually ordered. Yet more often than not a routine exam may not turn up the culprit of the disorder. Yet because of the advances in diagnostic technology, many veterinarians are now equipped with thermographic cameras that look like a handheld camera. The vet will be able to train the device onto the hose and thus scan the heat patterns that the animal produces. White areas are considered hottest, which black portions are the coldest. The colors in between denote gradual declines or increases between these two colors. indicate problems, yet a fetlock that is extremely different in temperature from the others is not only an indicator of a problem but may actually point to problems that have not yet developed into full scale medical issues but may be well on their way, such as beginning arthritis that is not yet pronounced enough to be picked up with other diagnostic tools. This is especially significant if an exam conducted at a later date shows that there is still some residual heat emanating from a previously affected site. At this point the use of radiography may be indicated and those finding, when combined with the thermographic exam, could very well lead to the earliest possible detection of arthritic pain, the animal’s attempting to compensate for it, and the resulting lameness in another limb as the effect of this procedure. This not only helps to treat the limb that is actually affected by a problem, but also prevents the sometime lameness of the animal to continue. Thermography is also a great tool when all other exams come back negative but you still have the gut feel that something is not quite right with your horse. If you are a trainer you probably have a much better relationship with your horse than anyone else, and you can tell if movements are suddenly off by even a fraction! If, for example, your horse suddenly is not able to move its neck as far to the right as it did before, a veterinary exam may not reveal anything amiss, yet with a thermographic camera the veterinarian may notice a definite change in pattern along the right side of the neck, perhaps specifically alongside the fourth cervical vertebra. Perhaps there is a lack of temperature rather than an increase and everything points to a pinched nerve root. A follow-up examination via the ultrasound will quite possibly show that there is a lump of tissue that may have been a remnant of a past trauma which is now once again affecting the animal. Treatment may be conducted with the help of an anti-inflammatory that is administered into the lump. These examples prove that thermography is a useful tool in equine diagnosis and treatment. While it is true that this camera has been available for a while, it is only recently that applications have bee developed to adequately employ it in the veterinary practice. A veterinarian will need to learn how to read the camera results, yet with a bit of practice this is easy to accomplish. 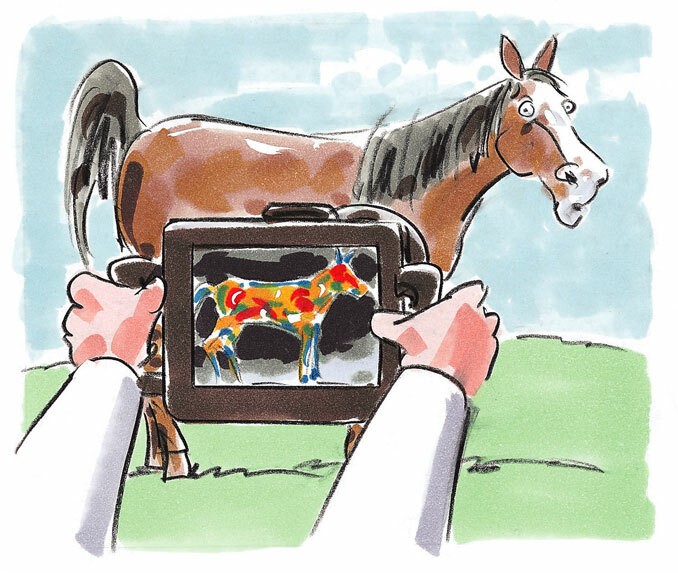 Following the principle that every animate object radiates heat, thermography allows you to see exactly how much heat is emitted by a horse at any given moment. Infrared detection measures the heat and the video image translates this result into a picture that may be interpreted for the sake of treatment. In days gone by the equipment needed was unwieldy and hard to use, yet the consistent modernization has resulted in the creation of cameras that are small, hand-held, and very easy to operate. You may remember the 1996 Atlanta Olympics which were the point in time when thermography entered the mainstream of sports medicine. Problems with tendons and ligaments are easily diagnosed with this non-invasive tool, and the tell-tale signs of inflammation and tissue damage may be diagnosed a lot sooner than with conventional methods. Farriers are also joining the ranks of professionals who realize the many advantages thermography is offering. Hoof problems and hoof changes can be diagnosed with the help of thermography, thus helping the farrier to realize the early formation of a deep abscess, laminitis, and also wall bruises that require specialized shoeing. As you can see, there are a plethora of applications for this diagnostic tool, and it does not matter if you are looking to investigate potential problems with your horse’s back to evaluate a poor saddle fit, or if you are looking to take a look at the effectiveness of leg wraps and hydrotherapy to affected limbs, thermography will be a useful tool for the properly trained veterinarian who learns how to use it in accordance with the specifications of the machine. Read the next horse health tips article on Horse Acupuncture Treatments.